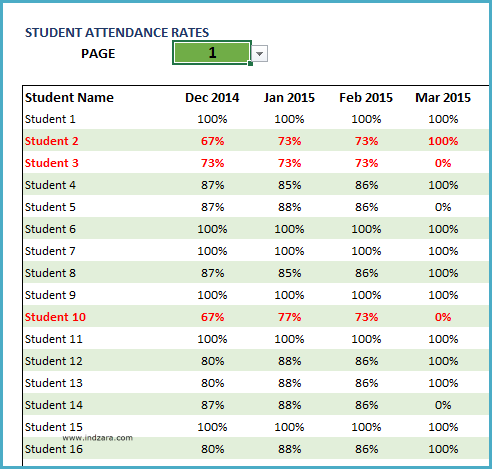 Track student attendance and create attendance reports instantly using this Excel Template. Choice for Weekends: You can choose which days of the week and which week days of a month are considered weekends (holidays). The template has four sheets 1) Settings 2) Attendance Register 3) Class Attendance Report and 4) Student Attendance Report. Step 2: Enter information daily in Attendance Register worksheet. Enter School and Class Information. You can set the minimum attendance required. Enter the academic period begin and end dates. The template can support attendance taken once a day or twice a day. If you would track attendance twice per day, enter 2 and then enter a name for the second instance. If attendance is taken twice per day, each instance will equal half a day. By default, AM will be the name for the first instance. You can change the name if you would like. This will appear in the Attendance Register. Set the weekend days in your school. In the image below, you can see that all Sundays and second Saturday of every month are considered as weekends. These days will not be available in the Attendance Register. The template makes it easy for you by avoiding these days while entering attendance. In addition to weekends, you can also enter holidays and these days too will be removed from the Attendance Register. Please note that it is recommended that you enter holidays that are in the future and not in the past. You can have up to 5 different values by which you are tracking attendance. By default, P is for Present and A is for Absent. Both P and A are considered to be Working days but P is counted as Attended while A is considered not attended. You can change these to suit your needs. You can also add more values (for example L for Late, E for excused, etc.). Let’s consider an example where you have some students who don’t have school on Wednesdays, but other students do. In that case, you can create a value (let’s say N) and mark it as WORKDAY = 0 and ATTENDANCE = 0. For those students who don’t have school on Wednesdays, you can mark the attendance with N. This would make sure that the attendance rate for those students are calculated correctly. To help with data entry, you can enter a default value. In the template, it is set as P. You can change it if needed. So, when we go to the Attendance Register, if you don’t mark any value for a student, it will be considered as P. This saves a lot of time since you only have to mark absent students (which is usually fewer). The template can handle up to 200 students. Data entry is very easy. Enter Student name and start marking attendance. There are placeholders for two custom fields. For example, you can use them to track student numbers or other student information. These will appear in the Student Attendance report which we will see later. If you would not need the fields, just clear the content (FLD 1 and FLD 2). You can view and print class attendance report. It is fully automated. You can see the summary 1) Number of Students, 2) Number of Working Days, 3) Overall Attendance Rate 4) Number of Students not meeting requirements. You can also see the monthly breakdown of number of working days and attendance rates. The template also shows the best performing and least performing students (with respect to attendance rate). The second page in the class attendance report provides student summary. It shows 50 students at a time. You can use the page drop down to choose the next page to view the next 50 students. You can print individual student attendance report by choosing student name. It is fully automated and does not require any data entry. The student attendance report provides the summary of student’s attendance. It will also show whether the student has met the attendance requirements. You can also see the monthly attendance rates. In addition, daily attendance will also be displayed. This ensures that the single page report provides all necessary information about the student. Both reports have placeholders for teacher signatures. I have been searching for a student attendance spreadsheet for a long time. I am so glad I came across this. I actually use this for my Volunteer Camp Staff and thier attendance and time for training classes. Thank you so much INDZARA.